(Nanowerk Spotlight) Catalytic nanoparticles play a crucial role in accelerating chemical reactions by offering their active sites and surfaces. Fine-tuning surface structure during synthesis and phase transformations can enhance their catalytic activity and durability by manifolds. However, control and feedback on the synthesis/transformation studies demand characterization techniques that can provide structural and compositional information on the atomic level. "Recent developments in electron microscopy pertaining to its instrumentation (aberration correctors, ultra-fast electron energy loss spectrometers, monochromators) and the innovation with respect to specimen holders (in situ liquid cell, in situ heating, tomography) have benefitted the study of catalyst nanoparticles enormously," Sagar Prabhudev, a PhD student in Prof. Gianluigi Botton's Microscopy of Nanoscale Materials Research Group at McMaster University, explains to Nanowerk. "As a leap forward in studying the phase transformation of nanoparticles, we have, for the first time, coupled advanced electron microscopy techniques such as high angle annular dark field imaging (HAADF) and electron energy loss spectroscopy (EELS), with in situ heating ability." By exploiting this setup, the research team studied the disorder-to-order transformation of platinum-iron (Pt-Fe) alloy nanoparticles, a material that is of great interest to fuel cell electrocatalysis as well as ultra-high density information storage. They reported their findings in ChemCatChem ("Surface Segregation of Fe in Pt–Fe Alloy Nanoparticles: Its Precedence and Effect on the Ordered-Phase Evolution during Thermal Annealing") where these results have also been featured as a cover profile. The team's work is highly relevant against the backdrop of fuel cell research, specifically Polymer Electrolyte Membrane fuel cells (PEMFC) – a highly promising energy conversion system that can convert chemical energy into electrical energy with minimal or zero emission of greenhouse gases. Here, the cathodic reaction – called the oxygen reduction reaction (ORR) – in a PEMFC is notoriously sluggish, requiring efficient catalysts to accelerate the kinetics. Traditionally, platinum has been used in this regard, but despite its exceptional catalytic activity it is now widely accepted to be an unrealistic choice due to depleting stocks and exceedingly high costs. 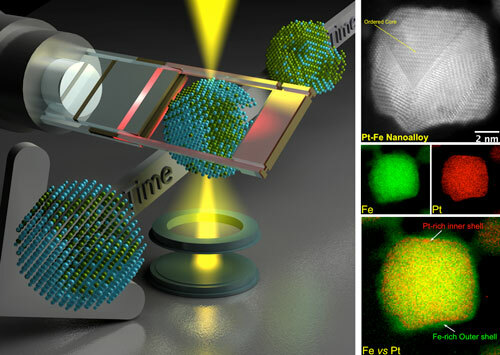 In an ongoing attempt to reduce the mass loading of Pt, there is a large body of research that suggests that a nanoscale alloying of Pt with transition metals (such as Fe) is a more viable option. "In this regard, there is growing interest in optimizing the structure-property-performance relationship of Pt-Fe alloy nanoparticles towards fuel cell catalysis," notes Prabhudev. "One prominent approach to obtain catalytically superior Pt-Fe alloy structures is by promoting a diffusion of Pt and Fe atoms through thermal annealing (or, simply put, heating). Depending on where the atoms end up after heating, different structures result and consequently, their properties can be optimized." "For instance" he points out, "platinum atoms on the surface – in the form of a shell – are great for catalysis but an iron-shell is not. So, in order to enhance their performance, it was important for us to first understand the atomic rearrangement process taking place during heating." By integrating atomic-resolution imaging and in situ heating with spectroscopy techniques, the scientists have captured the interplay between various nanoscale phenomena such as surface-segregation, atomic-ordering, Ostwald ripening and coalescence. They point out that these insights were hitherto inaccessible with traditional analytical methods. Owing to instrumental limitations, nanoparticle phase transformations have traditionally been carried out ex situ, i.e. heating a batch of nanoparticles in a furnace and then examining them under the microscope to see what changes have occurred. However, given the extremely small size of nanoparticles, it was difficult to track the same particle. This meant that analytical work was carried out on size-wise similar – but not identical – particles, often resulting in misleading findings. Advanced Electron Microscopy – The analytical methods described in the work have broadened the scope of electron microscopy towards characterizing the dynamic behavior of nanoparticles. More generally, these techniques are widely applicable to studying phase transformations of a broad range of nanomaterials. Future efforts could be expected in the direction of gas-phase annealing in environmental-TEMs; optimizing electron microscopy to minimize beam-induced damage; and high-temperature drifts. Nanoscale Phase Transformations – Tracking the same nanoparticle is arguably the best approach to maximize insights obtained on the dynamic behavior of nanoparticles during heat-treatment. As illustrated in the work, it is possible to capture various phenomena such as surface-segregation, atomic-ordering, Ostwald ripening and coalescence. Although the interplay between surface-segregation and atomic-ordering has been illustrated in the work, there can be interplay amongst all these processes; and future efforts towards elucidating them would be of great value. Especially in the case of polydispersed samples, although time-cost intensive, experiments on a range of particle sizes would be ideal to build a 3D data cube of size versus composition versus temperature. Fuel Cell Catalysis – In contrast to earlier reports suggesting Pt segregation, the team's findings reveal surface-segregation of Fe and the formation of a Fe-rich shell. However, from an ORR electrocatalysis viewpoint, it is not desirable to have Fe-rich shells. Consequently, future efforts could be directed towards performing a similar study in relation to other catalytic nanoalloy systems such as (Pt-Co, Pt-Ni, Pt-Cu) – and if the transition metal (Fe, Co, Ni, Cu) segregation is inevitable, then employ routine surface-cleaning techniques such as voltammetric dealloying as a post-treatment after annealing. Interestingly, numerous recent studies have shown that it is possible to also achieve Pt-shell structures (ideal for catalysis) with a controlled voltammetric dealloying procedure.